It didn't take long for Jason Cole, a Yahoo! NFL Reporter, to learn that mis-tweeting something can spark a massive reaction to somewhat moderate news. 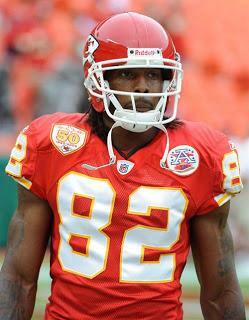 Cole tweeted out a report that the Miami Dolphins and Kansas City Chiefs could be working out a trade for disgruntled and currently franchise-tagged wider receiver, Dwayne Bowe. After a firestorm of responses, Cole quickly responded that he never actually meant that a trade was in progress, and instead reaffirmed what we already all knew — Bowe wants out of Kansas City. Still, even if Cole's intention was nothing more than speculation, it does propose and interesting question. With the trade deadline quickly approaching, would the Kansas City Chiefs be willing, and should the team, trade away Bowe? It would be logical to think that most Kansas City fans would have the immediate knee-jerk reaction of: absolutely not. Bowe is arguably the best weapon on the offense (the only competition being Jamaal Charles, but that's comparing apples to oranges), and he has been the most consistent contributor on the team over the past five seasons. Not to mention, who doesn't love Bowe on their fantasy team? However, what most fans fail to realize (or as we like to believe, are living in total denial) is that Bowe wants nothing more than to get out of Kansas City. Not only did the organization's failure to work out a long-term deal and franchise tag irritate him, but Bowe must have a propelling desire to play for a winning team. The chances of Bowe walking out after this season are incredibly likely. The dude has basically made his intentions entirely clear, and the Chiefs are living in a fantasy world if the team actually thinks he is going to re-sign after the franchise tag ordeal. The front office should have the awareness to see the writing on the wall — Bowe isn't coming back. With that in mind, the only logical option is to deal him away. Bowe is disgruntled, has plans to leave and the Chiefs are certainly not going to make a sudden Tim-Tebow-esque-playoff-inspiring run with or without him on the team. Really, Kansas City has nothing to lose by dealing him away and everything to gain. Although Bowe isn't elite, the Chiefs could still receive back some good value — I'm guessing a second-rounder at the highest and a few other pieces. What's to lose? In this situation, KC might as well cash-in when the team still has a chance.